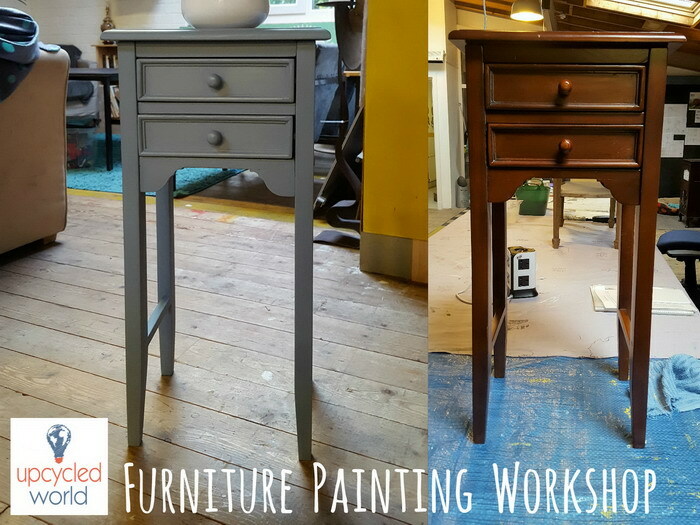 The furniture painting workshop is a fun introduction to upcycling furniture. Relax and let your creativity flow whilst you learn new skills and customise your furniture! Come join us at our studio – 6.17, St Margarets House, 151 London Road, EH7 6AE. You’re welcome to bring along or pre-order, a small item of wooden furniture e.g. a small side table, coffee table, magazine rack, dining chair, small cabinet or a stool. During the furniture painting workshop you will gain lots of new skills and techniques to help you design and upcycle your piece of furniture. Such as, how to prepare your piece, make your own chalk paint, brush work skills to achieve a flat or textured finish, taping to add designs to your piece, distressing for the shabby chic look and how to protect your furniture with a wax or varnish. Flat Finish – You’ll learn the basic techniques required to achieve a clean, finished look for your furniture. Distressing – For those interested in the shabby chic look, you’ll be shown how to distress your furniture. Taping – Want a more funky or retro look? You’ll learn how to use masking tape to create designs. Furniture upcycling gives you the creative freedom to custom design your own furniture and home. Following the workshop, you’ll be fully equipped with the skills and knowledge needed to confidently use the paints and waxes on your own. You’ll be given the remainder of one small pot of chalk paint that you’ve mixed and instructions to take home with you. There is free parking onsite and bus stops right outside the building. A light snack, usually a tasty homemade soup or fresh salad will be provided. We also offer a 10% discount on furniture painting kits, tools and materials purchased during workshops.